The abacus is an ancient calculating machine. This simple apparatus is thought to have originated in Babylon about 5,000 years ago. Today, the abacus is still used commonly in Japan, China, the Middle East, and Russia. 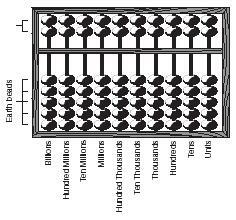 In China, the abacus is called a suan pan, meaning "counting tray." In Japan, it is called a soroban. Japanese school children are still taught how to use the soroban, and competitions are held annually to find the most skillful calculators. Historians think that the first abacus consisted of a shallow tray filled with fine sand or dust. Numbers were recorded and erased easily with a finger. The word abacus, in fact, may have come from the Semitic word for "dust," abq. A modern abacus is made of wood or plastic. It consists of a rectangular frame about the size of a shoe-box lid. Within the frame are at least nine vertical rods strung with moveable beads. A horizontal crossbar perpendicular to the rods separates the abacus into two unequal parts. The beads above the crossbar are known as heaven beads, and those below the crossbar are called earth beads. The numerical value of each bead depends on its location in the abacus. Each heaven bead has a value of five times that of an earth bead below it. Each rod represents columns of written numbers. Beads on the vertical rod farthest to the right have their values multiplied by one. On this rod, each earth bead is one and each heaven bead is five. Beads on the second rod from the right, however, have their value multiplied by 10. On this rod, each earth bead represents 10 and each heaven bead stands for 50. Beads on the third rod from the right have their value multiplied by 100, so that each earth bead represents 100 and each heaven bead stands for 500, and so on. To operate, an abacus is placed flat and all beads are pushed towards the outer edges, away from the crossbar. Beads are then slid upward or downward to represent a number. The number 7, for example, is represented by moving one heaven bead (worth 5) downward toward the crossbar and two earth beads (worth one each) upward toward the crossbar. The number 24 is represented by moving two earth beads on the second rod (worth 10 each) and four earth beads on the first rod (worth 1 each) upward. Addition, subtraction, and even lengthy multiplication and division problems can be solved with an abacus. Advanced users can even find the square root of any number.